The $22 trillion official national debt is a much discussed problem, even as politicians exhibit zero motivation to do anything about it. But as big an economic overhang as it is, government debt isn’t likely to trigger the next financial crisis. Yes, servicing the growing federal debt bubble will depress GDP growth, cause the value of the dollar to drop, and raise inflation risks. But the bubble itself won’t necessarily burst – not anytime soon. Where Will The “Pending” Financial Crisis Originate? The case for a pending financial collapse is well grounded. Financial crises occur on a regular basis including 1987, 1994, 1998, 2000, 2007-08. The “Plunge Protection Team” is the colloquial name for the Working Group on Financial Markets (WGFM). The Working Group was established by the executive order of President Reagan in 1988, in the aftermath of the stock market plunge of October, 1987. The group reports to the President, and the official members of the group include the Secretary of the Treasury, the chairman of the Federal Reserve, the chairman of the SEC, and the chairman of the CFTC. In other words, the group members are the four most powerful financial officials in the United States. In practice, the committee can be composed of senior aides and officials that have been designated by those top officials. The economic world is always changing, but the 2018-2019 period will mark an important transition. 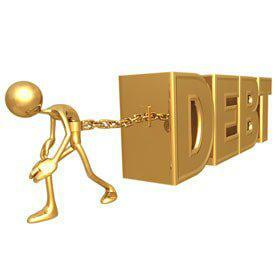 Consider credit market debt, interest rates, stock indices, individual stocks, and several ratios. TOTAL CREDIT MARKET DEBT per the St. Louis Fed. That measure of U.S. debt increased exponentially from 1951 to 2007 at a rate of 8.8% per year. However, the rate from 2008 to 2017 has been only 2.6% per year. A sixty-year trend changed during the 2007-08 financial crisis. As suggested by others the U.S. reached debt saturation. The economy has not recovered since the crisis. 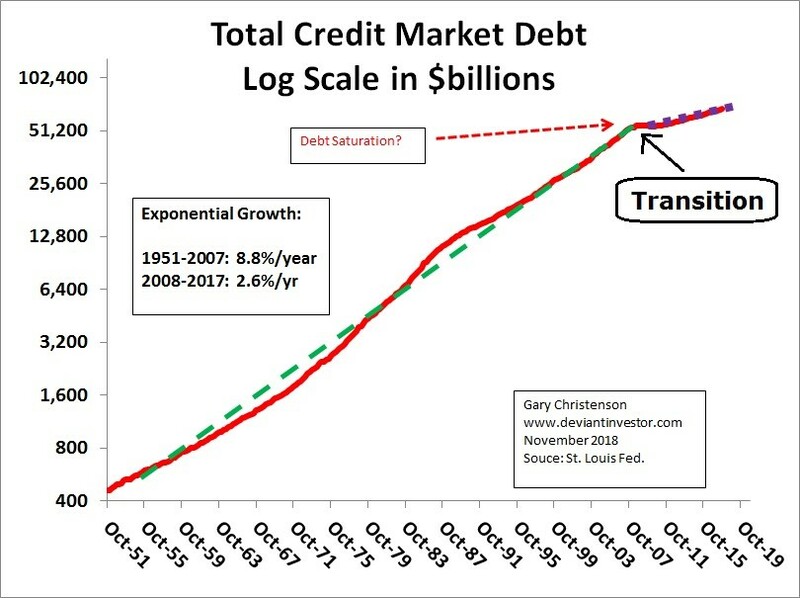 The graph of credit market debt supports that thesis. Stock markets are forever cyclical, an endless series of alternating bulls and bears. And after one of the greatest bulls in US history, odds are a young bear is now gathering steam. It is being fueled by record Fed tightening, bubble valuations, trade wars, and mounting political turmoil. Bears are dangerous events driving catastrophic losses for buy-and-hold investors. Different strategies are necessary to thrive in them. This major inflection shift from exceptional secular bull to likely young bear is new. By late September, the flagship US S&P 500 broad-market stock index (SPX) had soared 333.2% higher over 9.54 years in a mighty bull. That ranked as the 2nd-largest and 1st-longest in US stock-market history! At those recent all-time record highs, investors were ecstatic. They euphorically assumed that bull-run would persist for years. Money manager Michael Pento says things are going to get much worse from here. Pento explains, “They understand when the stock market goes down, consumption and the wealth effect crumble, and the economy is going to falter. First let’s explain exactly what a “Fed Put” is. A Fed put is defined as: The confidence of Wall Street that the Fed will lower interest rates and print money to support the market until economic strength will be strong enough to carry stocks higher. The term “Put” is ascribed to this because a put option is basically a contract that offers a buyer protection from falling asset prices. It was first coined under the Chairmanship of Alan Greenspan when he lowered interest rates and printed money to rescue Wall Street from its 22% Black Monday crash back in 1987. The practice of bailing out stocks was institutionalized by Ben Bernanke; and then became a bonafide tradition perpetuated by Janet Yellen.